After many years of experience transforming homes, our expert interior designers truly understand the importance of home rennovation projects. It is not uncommon as a home owner to feel the need for change after living in the same house for an extend period of time. Whether it is one specific room or an entire floor plan, keeping a static layout can get tiresome and motivate you to make a change. The hardest part in making a design change is figuring out what you want and how you are going to accomplish it. The warm weather and scenery that surround the Tucson AZ area give way to plenty creative opportunities, which make it the perfect place to utilize the expertise of a professional interior designer. While it can be challenging to bring a designer into your home, hiring an expert in the industry has many added benefits that can make the most out of your experience. From start to finish, putting together an interior design plan can be very time consuming. Working a full-time job or taking care of the family and kids can leave you short of time. A professional designer is trained in how long it takes to plan and orchestrate a full project plan for all types of rooms in the house. This comes from experience in picking out furniture, selecting colors, and ultimately figuring out what is going to fit right in the home. Along with the time you will save, you will also save money! Whether you want to add brighter colors in the sunroom or give a fresh look to your kitchen, having the right expertise at your disposal will make sure you know where all of your money is being allocated to and that you are receiving the best value. Maybe design just isn’t a part of your everyday life. Not everyone can keep up with modern day trends and it can be difficult to put thoughts into action to get the perfect room you desire. Interior designers spend a great amount of time exploring different products on the market and keeping up with the latest industry trends, so you don’t need to! Often, bringing in a professional with home décor expertise is exactly what’s needed to get your project rolling. 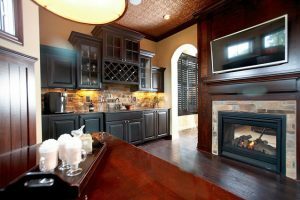 An expert can select quality options that fit your taste and match the overall aesthetic of your home. Here at Encantada Designs, we want to help you develop a customized design plan, source the perfect products, and deliver transformative results. We provide exceptional residential services that will meet your needs and build off the look and style you desire for your ideal living space. To get started on your dream project, give us a call today!